One thing I know about Mike is that he LOVES raspberry freezer jam. 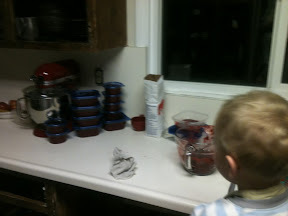 For his birthday this year we got 2 flats of raspberries from Logan and made jam. Here we are half done. 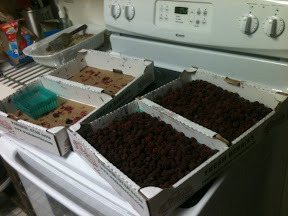 In all we got 20 containers of jam. I think we are set for awhile. Ooh, Adam too. He's always complaining if I buy store bought jam. 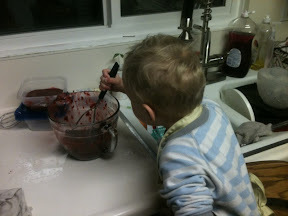 Its either store bought or stolen from his mom because I have never made jam. Maybe next year.